Berlin, Germany. Wittenbergplatz U-Bahn station. "Places of Terror We Must Never Forget," 1967. Erected by the League for Human Rights. Photo: Samuel D. Gruber 2003. After my visit to Berlin in November, I've been posting about some of the less well known Jewish and Holocaust-related monuments and memorials in the city. I've already posted about the Münchener Strasse Synagogue monument, the Jewish cemetery on Grosse Hamburger Strasse and the monument and burial section at the Weissensee Cemetery for Jewish soldiers who died in World War I. 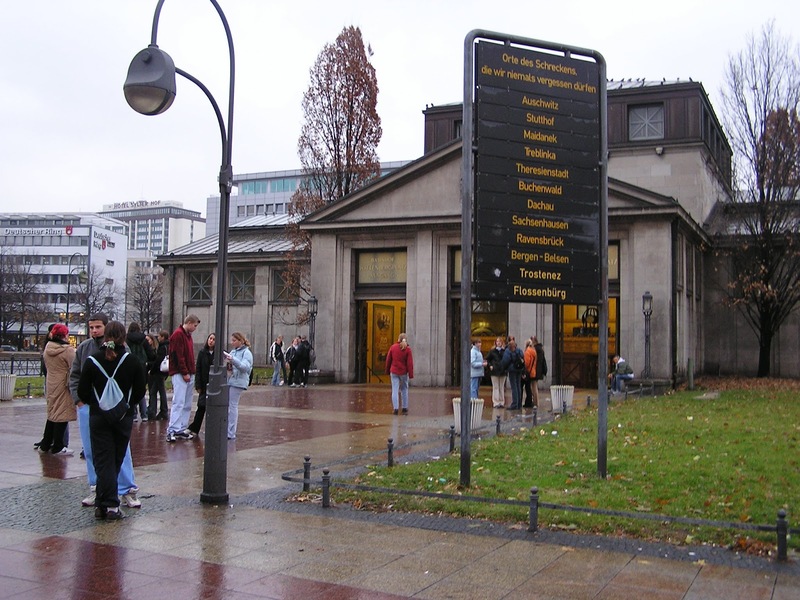 One of the notable aspects about the memorial landscape of Berlin is important role of train stations as sites of commemoration. This is not new to Holocaust memory - there is an impressive memorial to rail workers killed in World War I located within the Nollendorfplatz U-Bahn Station. Berlin, Germany. Nollendorfplatz U-Bahn Station. Memorial to Rail Workers killed in World War I. Photo: Samuel D. Gruber 2016. 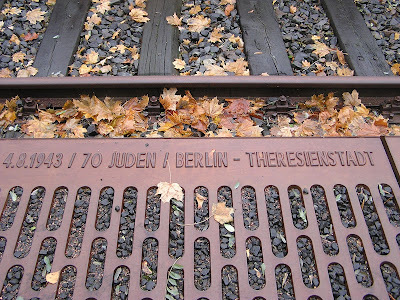 But train terminals and depots, and U-Bahn and S-Bahn stations now host several Holocaust memorial memorials and markers, too. This isn't surprising considering the central role trains played in the deportation of Jews from cities to ghettos, and from ghettos and transfer sites to death camps and execution. 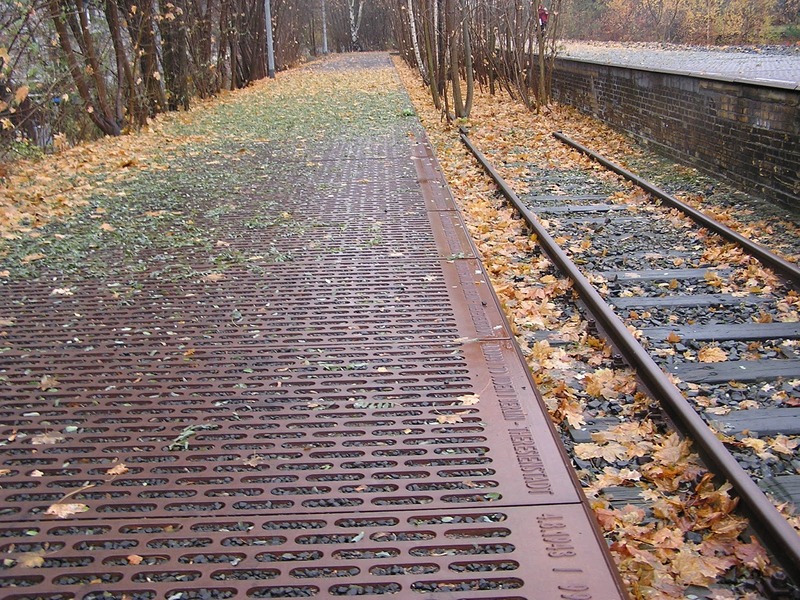 Throughout Europe there are now several important memorial sites associated with train stations and rail links, the inclusion of rail tracks and old boxcars is a familiar - and even overdone - trope of modern Holocaust museums and exhibitions. The boxcar, cattle car or open coal car universally recognized symbols of the Holocaust as much as the Warsaw Ghetto boy with raised hands photographed from the Stroop Report or the stripped uniform of concentration camp inmates. 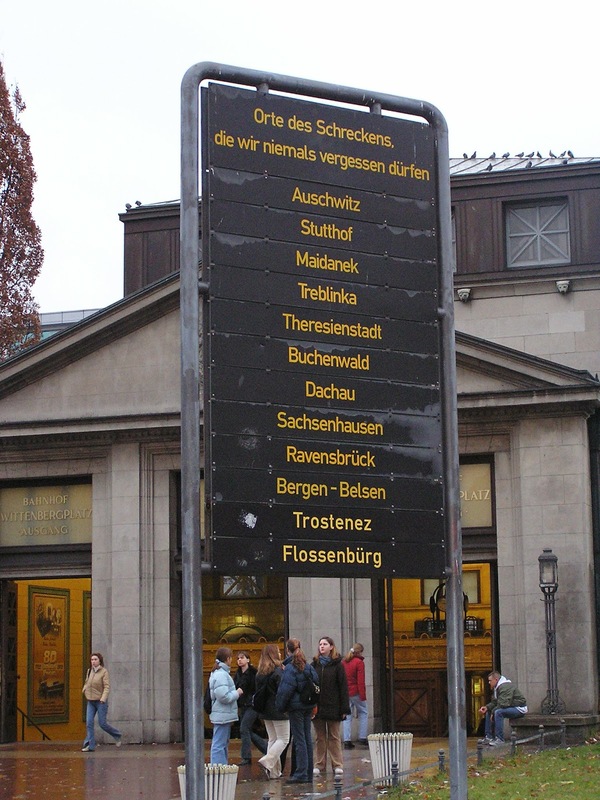 In Berlin, at the Wittenbergplatz U-Bahn Station, is the striking memorial signpost - that lists the names of concentration and death camps as destinations as simply if they were on the schedule of daily commuter trains. The ordinariness of the sign means that thousands of Berliners and visitors pass it everyday without ta thought - but that is the idea - a reminder that that is exactly what happened when Jews were rounded up and deported in Berlin and hundreds of other towns and cities and their neighbors hardly reacted. We must remember the horrors of the Nazi regime began and took route in the relative normality, or at least ambivalence and avoidance, of everyday daily German life. Train stations, trains, and train workers were essential to the successful removal of social undesirable, and the eventual execution of the Final Solution throughout Europe. 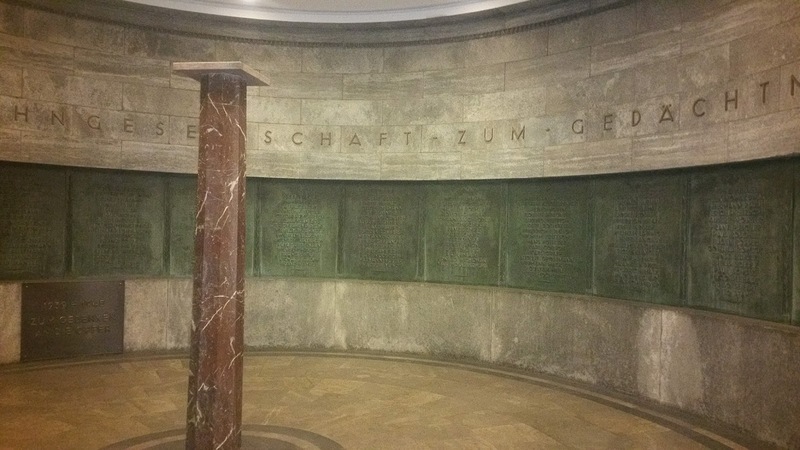 Today, at the Nollendorfplatz ststion, where the World War I memorial is a room of its own mostly passed by without thought by busy commuters, there is also a recent memorial affixed to the exterior of the station that commemorates the persecution and murder of homosexuals by the Nazi regime. 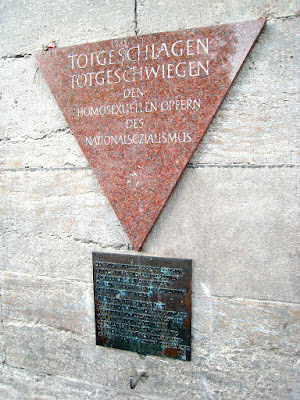 The inscribed inverted triangle says "Put to death, put to silence - for the homosexual victims of National Socialism. "Nollendorfplatz was the center of gay nightclub and social life -in the Berlin in the 1920s and early 1930s, most famously at the Eldorado, and best known to English-speaking audiences through Christopher Isherwood's "Berlin Stories," made into the musical Cabaret. Isherwood lived at Nollendorfstrase 17. I'm told by a friend that riginally a large free-standing monument to contemporary Gay Pride in the form of a rainbow-colored pencil, was erected nearby the wall plaque. Due to vandalism, however, it was moved across the street onto a better protected, but more isolated, traffic island. Now the link between past persecution and the contemporary gay pride movement is less clear. This especially seems to be the case since I couldn't find information about the "pencil" monument online or in guidebooks. So if you know - tell me more! Berlin, Germany. 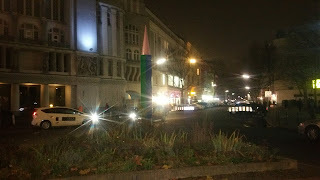 Nollendorfplatz rainbow pencil monument to gay pride. Photo: Samuel D. Gruber 2016. You can read more about the gay history of the neighborhood at Cabaret Berlin. Another memorial is the Memorial to the Homosexuals Persecuted Under the National Socialist Regime, which stands in the Tiergarten, opposite the Memorial to the Murdered Jews of Europe. 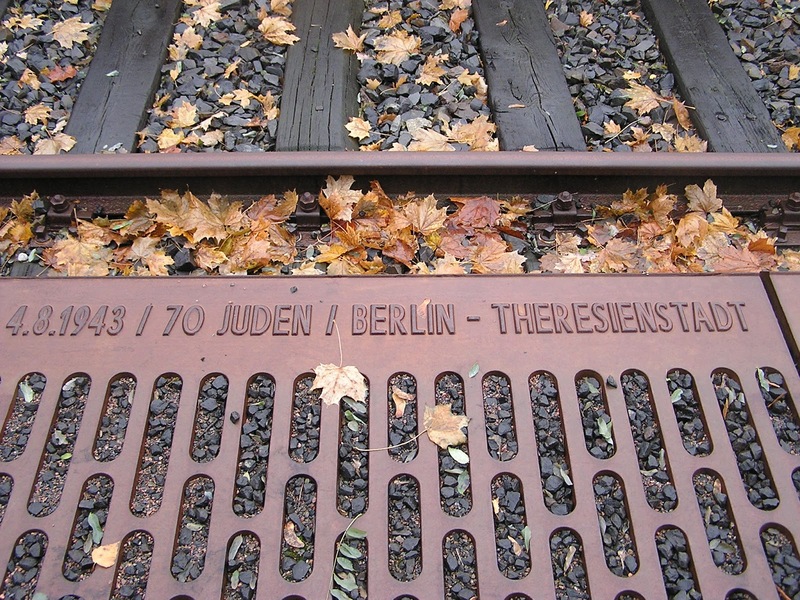 The most impressive - and costly - of the rail station memorials is the Grunewald Deportations Memorial and Track 17, erected in two parts - in 1991 and 1998 - to commemorate the approximately 35,000 Jews who were deported from the Grunewald Freight Depot to their deaths in East European Ghettos and Camps. The memorials are near the Berlin-Grunewald S-Bahn Station. In 1991, Polish sculptor Karol Bronitowski designed a eighteen meter long and three meter high concrete wall that appears partly broken and with deep cracks and with impressions of human silhouettes. An inscription on a column tells - very briefly - of the deportations. 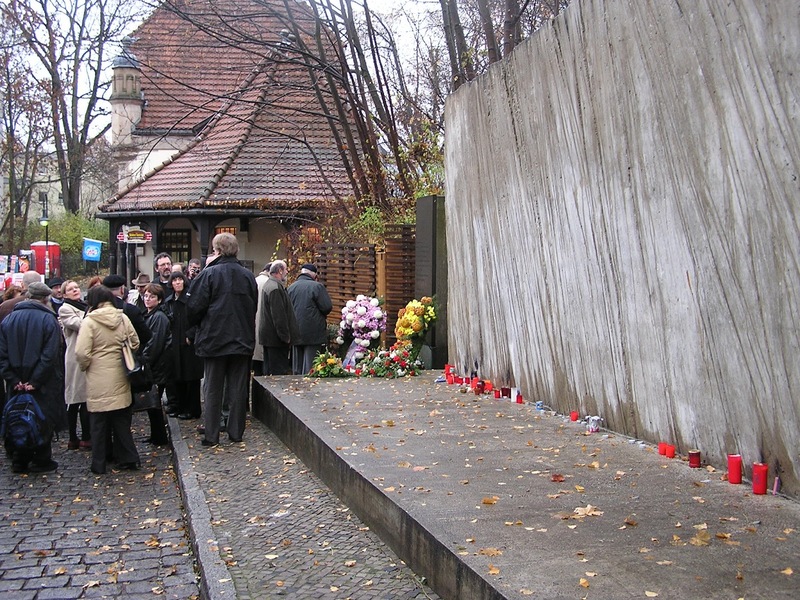 Bronitowski's memorial is mostly about the round up Jew's and their transport to the deportation platform. "The core element of the memorial is composed of 186 cast steel objects arranged in chronological order and set in the ballast next to the platform edge. Each object states the date of a transport, the number of deportees, the point of departure in Berlin and the destination. 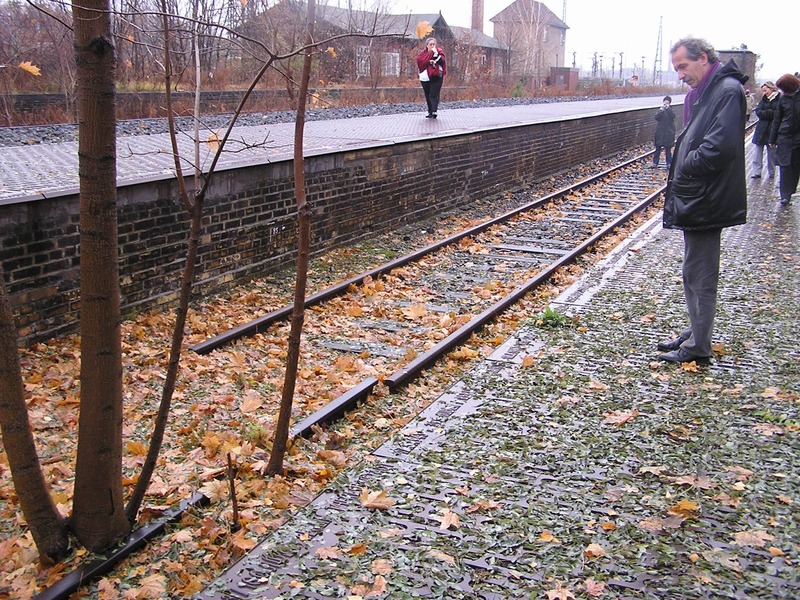 The vegetation that has developed at Platform 17 over the years has been left to grow between the rails and now forms an integral part of the memorial as a symbol that no more trains will ever depart from this platform." No business company can whitewash its history or choose which events in its past it wishes to remember. To keep the memory of the victims of National Socialism alive, the management board decided to erect one central memorial at Grunewald station on behalf of Deutsche Bahn AG, commemorating the deportation transports handled by Deutsche Reichsbahn during the years of the Nazi regime....Deutsche Bahn AG hopes that the memorial will help to ensure that the crimes committed during the National Socialist regime will never be forgotten. The memorial commemorates the victims, is a warning to future generations, and a place of remembrance. Berlin, Germany. 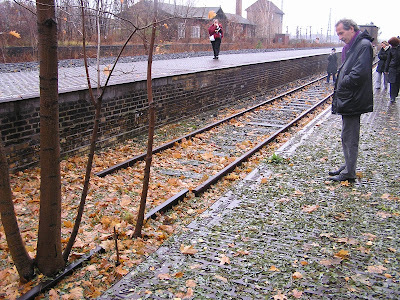 Grunewald, Track 17 Memorial. Hirsch, Lorch & Wandel, architects, 1998. Photo: Samuel D. Gruber 2003. There is another memorial to the deported on the Putlitz Bridge in Berlin, the runs across the railroad tracks of the Moabit freight depot. This was another point of departure for cattle cars carrying Jews heading east. The abstract monument, designed by Volkmaar Haase and erected in 1987. I have not seen this monument personally, so cannot comment on its effectiveness. There is another memorial to the deported on the Putlitz Bridge in Berlin, the runs across the railroad tracks of the Moabit freight depot. This was another point of departure for cattle cars carrying Jews heading east. The abstract monument, designed by Volkmaar Haase and erected in 1987. I have not seen this monument personally, so cannot comment on its effectiveness. There is another memorial to the deported on the Putlitz Bridge in Berlin, the runs across the railroad tracks of the Moabit freight depot. This was another point of departure for cattle cars carrying Jews heading east. The abstract monument, designed by Volkmaar Haase and erected in 1987.